The hottest weather is yet to come this summer, even long after the days of maximum solar radiation. The first day of summer was Wednesday, June 21. Also called the "summer solstice," this was the day when the sun was at its highest point over the northern hemisphere. It's the day that delivers the longest amount of daylight. Here in North Texas we received a whopping 14 hours and 20 minutes of daylight. Farther north up in Alaska, daylight extends to near 24 hours on the first day of summer! With the solstice now passed, daylight will slowly be getting shorter (by a couple minutes each day) as we head toward fall and eventually the winter solstice. The interesting fact though, is that the hottest weather is yet to come. Just because the amount of sunlight is less, this doesn't translate to less heat. It's quite the opposite here in North Texas. 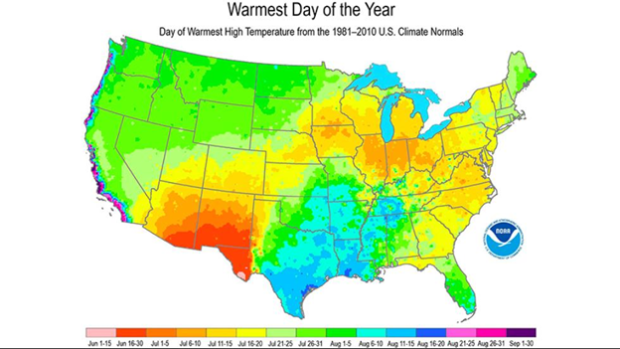 The map below shows the average "Warmest Day of the Year." You can see here in North Texas that typically arrives in early-mid August. By then, we will have lost almost an hour of sunlight compared to June 21. So why the lag-time from the longest daylight of the year in June to the hottest weather in August? This is because it takes several weeks for the heat transfer from the Earth into the atmosphere. Consider it a "heat build-up" that takes time to transfer to the atmosphere. This slow, gradual process starts during the spring and early summer and reaches its maximum by late summer. This "thermal lag" in the atmosphere is the same reason it takes a while to cool-down too. September and October are proof of this in North Texas, as it stays quite warm well into fall. 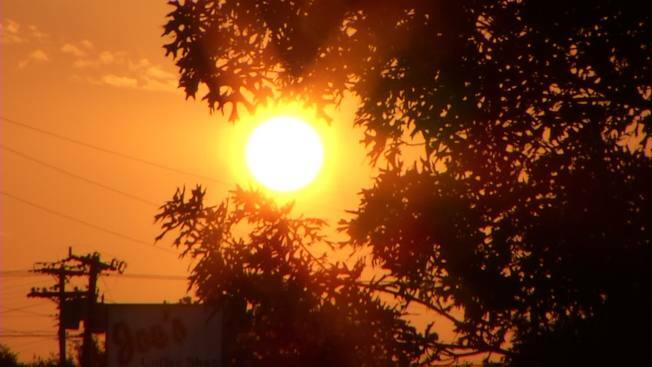 Here's the bottom line: pace yourself, the hottest weather is yet to come!